I few months back I went to the trouble of registering the Great Apartment on Google Maps, but I didn't realise that this would also make it show up in Google searches (a handy bonus). Not only do we turn up, but - in France at least - we are the first result on the first page! 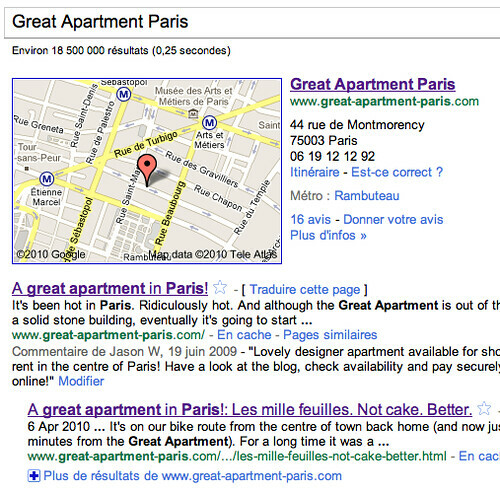 That means that if you type Great Apartment Paris and click "I'm feeling lucky", you're directed immediately to our site. Kinda cool. However, I know that Google results can vary from country to country. 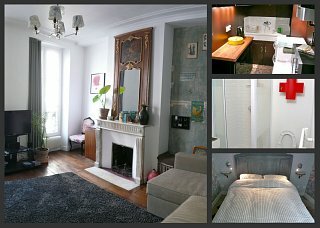 Could our loyal readers from abroad try typing Great Apartment Paris into Google and leave a comment to say whether we are top of the list in your country too? I'm curious to know... Thanks! works here in the U.S. - you are #1! works here in Australia - you're #1!